Ugh! It is going to get up to 112 degrees today and I am outside tending to the chickens and the solar oven. God Bless the person who invented the portable mister system that Ace Hardware sold me, I think I would be passed out right now without it. The good news is that despite this unbearable heat, the chickens and the gardens are doing quite well. 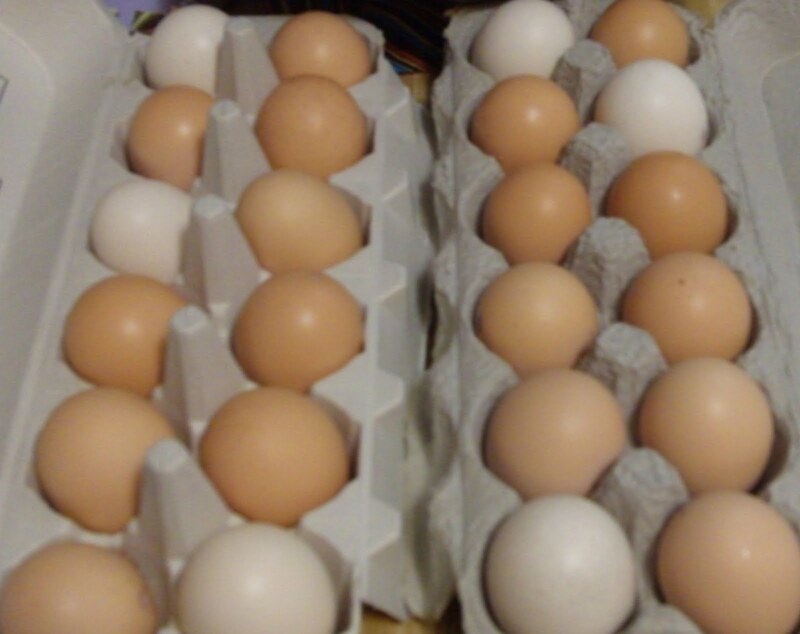 Our youngest hens are now 25 weeks old and they are all laying several eggs a week in various hues. We had a over 5 dozen eggs in July. Considering the hot days, that's not too shabby. We had enough eggs that we were able to share them with friends and our (oh so understanding!) neighbors. Not once have they complained about the "hen party" in the backyard when things get a bit noisy. Lucy soaking her feet. Or is it Molly? Our front garden has really worked out beautifully. Over the winter we lost the Lantana to a bad frost so we tore it out and replaced the flowers with a vegetable garden. This turned out to be a fabulous idea. The area is shaded until the afternoon and the plants are doing much better that the backyard veggie garden. 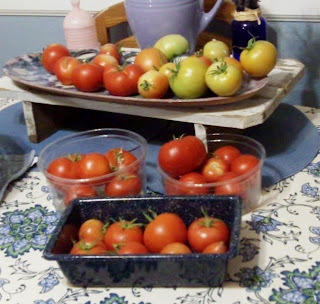 In the front garden we have several Better Boy and Early Girl tomatoes which are still producing. The Sweet 100 tomatoes were very tiny but make perfect chicken snacks. 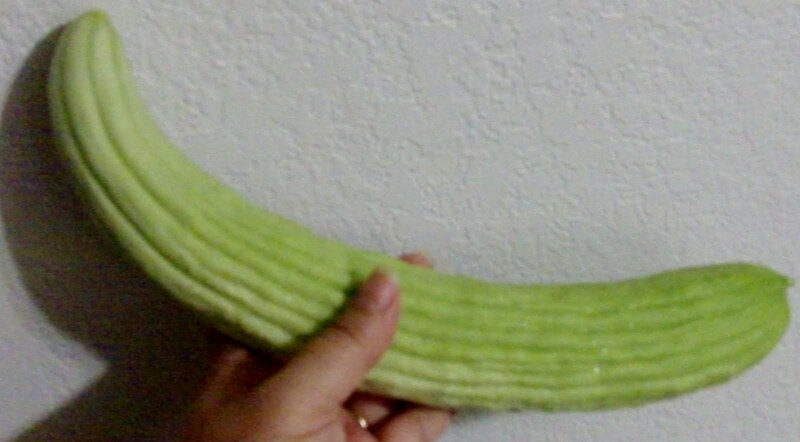 We have a single zucchini plant which, as anyone who has grown zucchini can tell you, yields more than enough zucchini for 2 people. The backyard gardens contain some heirloom tomatoes, cucumbers, and melons. Not much to say here as we have more crabgrass than garden at this point. 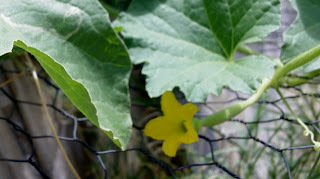 On a lark I threw in some seeds from and Armenian cucumber that I purchased at Lee Lee's. I completely forgot about them until the big monsoon in July uncovered this. . . I have no idea how long it had been growning under the grass and weeds but boy was it delicious. From now on I am only planting these babies. More good news - the bell pepper curse is finally broken. My inability to grow peppers is legendary in my family and it's quite funny since I can manage to grow just about anything else. 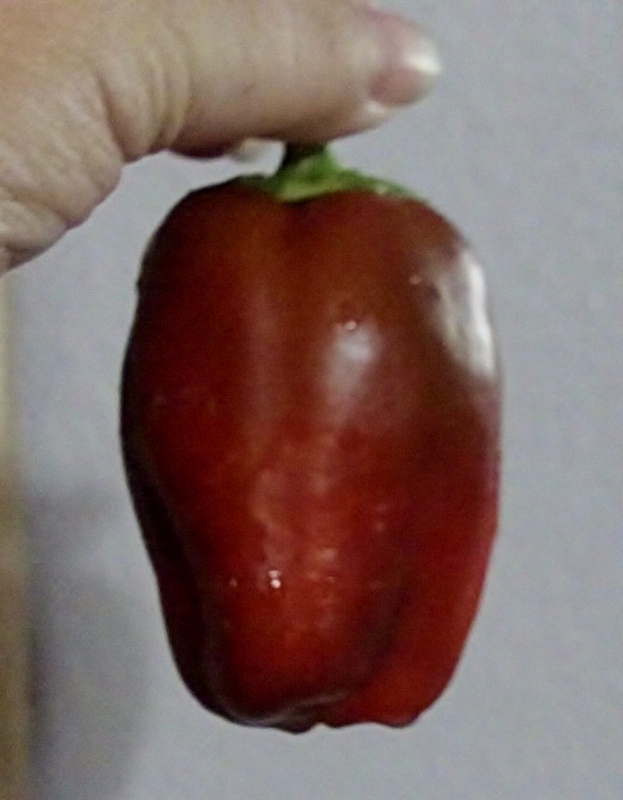 This season I finally was able to grow 2 red bell peppers in the front garden. Believe me, they are nothing to brag about and certainly wouldn't win any prizes at the county fair. Heck, they were barely big enough to add to a single dinner salad. Still, just the fact that I was able to keep the pepper plants alive and harvest a vegetable that could be clearly identified as a pepper - that is HUGE for me and I owe it all to chicken poo water. Yes, I said chicken poo water. It smells and looks just as disgusting as it sounds but the plants love it. You see, it is so hot here in the east valley that chickens find it very difficult to cool off. Heat related deaths of backyard hens are quite common here. Thanks to the folks at Valley Permaculture Alliance and the people on the Arizona board over at BackyardChickens.com I have learned about different ideas to make life more comfortable for my girls. 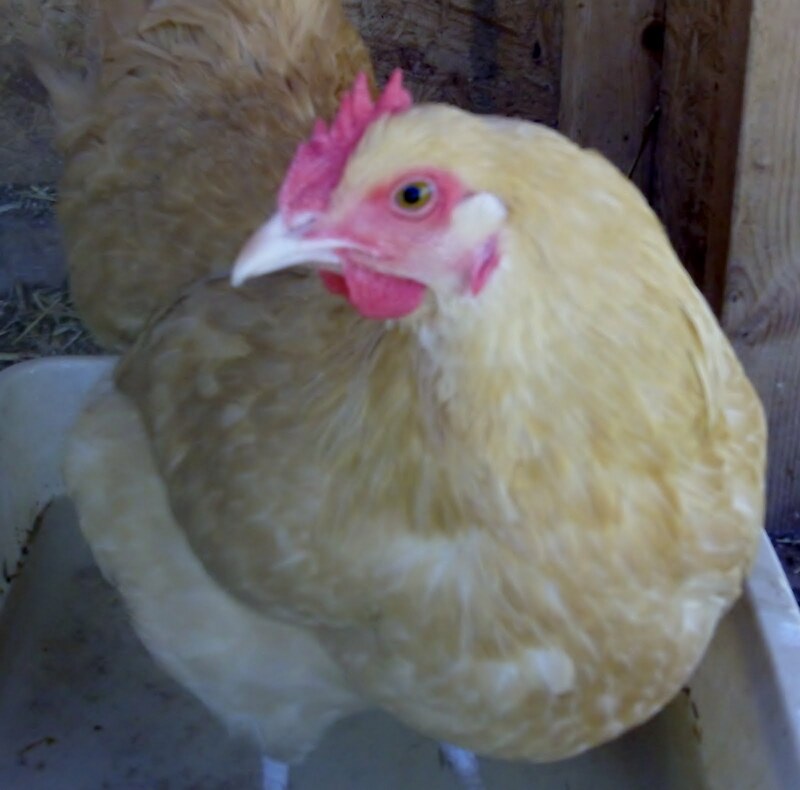 One way is to provide the hens with a shallow pan of water to wade in and cool off. They love it! HuzBen refers to the pans (actually cat litter pans) as the Hen Spas. Time to go and get the bread out of the solar oven - see you soon! Thanks for this great tip about the chicken poo water. We are in our first year of raising chickens here in Georgia. The summer heat has been beastly and renlentless. We just lost two of seven chickens and are trying to figure out why. Your idea will help. I have a blogsite, too, at www.readerwriter-writingfromtheinside.blogspot.com related to the work I do with women in prison. Would love to have you take a look! Leanna, you have a lovely blog and I envy your habitat and your voluntary simplicity!